Sharing NVMe over the network with local performance becomes an escalating challenge when cloud and mobile apps, IoT, and real-time analytics demand the lowest levels of latency. To meet these new requirements necessitates a storage strategy rethink. This datasheet details the technical specifications and features of a software-defined block storage platform that allows unmodified apps to utilize pooled NVMe devices across a network at local latencies and speeds. 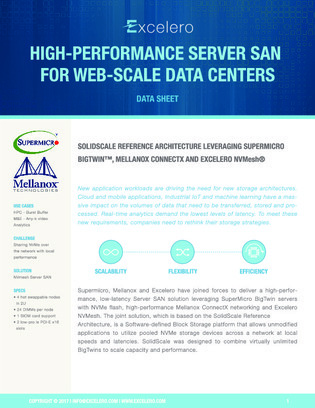 Read on here for the specs of this server SAN solution.